You don’t have to be an outdoor athlete to join or even have any outdoor experience - just the motivation to come out and play. Are you ready to meet other like minded women in an incredible alpine location to have fantastic adventures? The refuge - accessible by car but right at the foot of the mountains, no better place to base ourselves for alpine missions or rock further down the valley. Easy hiking from Pre de Madame Carle takes us easily into the mountains an up to the glacier. 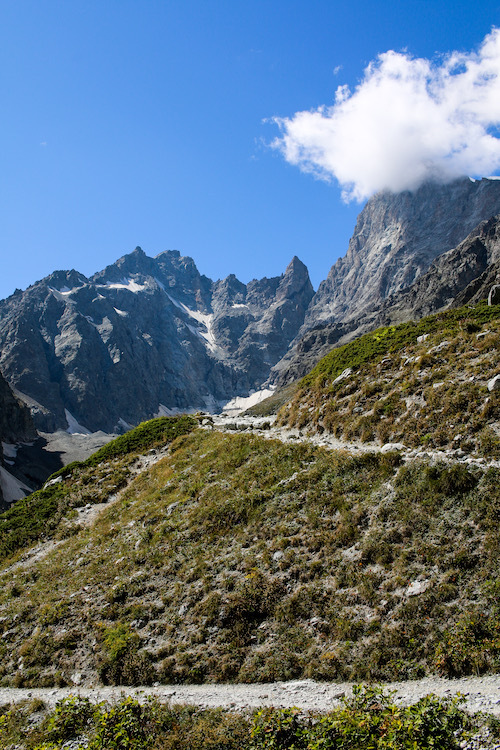 We will be staying at Pre de Madame Carle - the refuge at the foot of Pelvoux, Glacier Blanc and Glacier Noir, Ecrins. Rope skills - short roping, coils etc. 7 nights accommodation (saturday pm to saturday am), breakfast and dinner. not interested in any instruction? We’ve tried to make this as inclusive and cheap as possible for everyone, so you don’t need to attend every workshop and we may not be able to facilitate all of these for everyone but we have sufficient inspiring guides here with us for the week so we can really make the most of them. You may only want to do one day’s training on say crevasse rescue and rope work before heading off as a team to tackle your own summit goal. Really the guides are on hand at base camp to teach us whatever we feel we’re lacking and the rest is down to the more experienced members of our club to share with those newer to the outdoors. We’ll also be offering daily outdoor yoga classes (weather permitting and pay per class), pre-arranged pack lunches for those that want all the hassle taken out of it (price to be agreed depending on needs). How will I find a partner? Lots of you are coming to meet like minded women and climb and learn from each other. Once you’ve booked we will send you some additional details to fill in if we don’t have them already so we can hook you all up together easily in terms of activities, aspirations and experience levels. Don’t worry, we won’t force any partners upon you but we will probably set up a page for those attending and share details so everyone can meet virtually first (not everyone is on FB). Also, we will arrange a get together on the first night (25th May) and do something fun so we all get to know each other better!! We will stay in the mountain refuge of Pre de Madame Carle so we couldn’t be closer to the mountains. It is a refuge so don’t expect luxury 5 star treatment but it is a beautiful space to be. 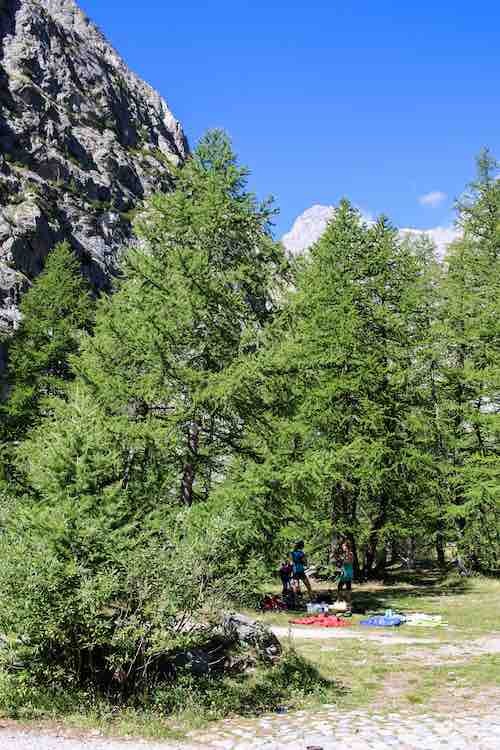 You can run, hike and rock climb from the doorstep as well as access the higher alpine summits. It is accessible by car (easy parking with lots of spaces) and for those that know it 5k further uphill from Ailefroide in the direction of the National Park. Resources are limited up there, there are no shops - so any additional supplies you need to bring with you or get from Ailefroide. Ailefroide however is a 40 minute walk downhill where there are climbing kit shops, small supermarkets and a few bars and restaurants. The food will be rustic but hearty but they will be able to cater for different dietary requirements - we ask that when you book. You can cook for yourself if you prefer but there’s no dedicated kitchen or washing up facilities at all so you would need to bring your own stove and do it outside as if you were camping. Saturday 25th and Saturday 1st will be travel days so we’re not planning any particular activities apart from a welcome evening on 25th. There’s plenty of parking available at the refuge. There are some details on how to get here on our location page. And also please use the Facebook group to share travel plans and hook up with others. Luckily my new neighbours have just taken over the refuge and offered us a group discount that works out at 10 Euros less per person per night!! Our different packages allow for everyone to join, whether you want to be involved in all activities or just the community aspects. We’ve simplified and organised the trip for you. These prices are not-for-profit, we’re just squarely sharing the cost of the adventure amongst us. OPTION 1 ‘all in’: £670.00 PER PERSON (INCLUDES: 7 NIGHTS ACCOMMODATION, breakfast & dinner, CLIMBING & alpine COACHING). OPTION 2 ‘no food just bed & instruction’: £480.00 PER PERSON (INCLUDES: 7 NIGHTS ACCOMMODATION, CLIMBING & alpine COACHING). OPTION 3 ‘just the instruction’: £370.00 PER PERSON (INCLUDES: CLIMBING & alpine COACHING but no digs or food). OPTION 4 ‘bed & food but without instruction’: £305.00 PER PERSON (INCLUDES: 7 NIGHTS ACCOMMODATION, breakfast & dinner). Hopefully this gives everyone a chance to join at a reasonable price. If you do choose option 2, do note you’ll need to cook outdoors in a camping scenario and bring all your own cooking essentials (including stove). You will need to pay in full to book your space and it is non-refundable so please be sure before you book. Prices are payable in GBP and will be subject to currency exchange rates at the time of booking. Women’s adventure club - 7 nights alpine refuge accommodation, food (breakfast and dinner), climbing and alpine coaching. Women’s adventure club - 7 nights alpine refuge accommodation, climbing and alpine coaching. Women’s adventure club - climbing and alpine coaching only. Women’s adventure club - 7 nights alpine refuge accommodation, food (breakfast & dinner).